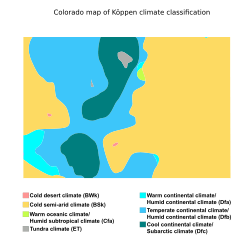 Colorado map of Köppen climate classification. 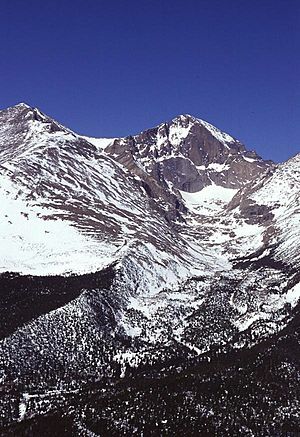 The summit of Mount Elbert at 14,440 feet (4,401.2 m) elevation in Lake County is the state's highest point and the highest point in the Rocky Mountains of North America. 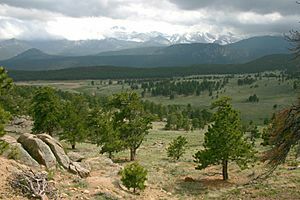 Colorado has approximately 550 mountain peaks that exceed 4000 meters elevation. 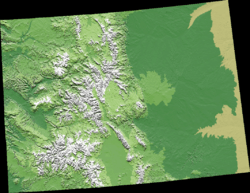 Colorado is the only U.S. state that lies entirely above 1000 meters elevation. 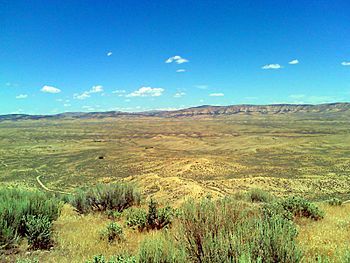 The state's lowest elevation is 3,317 feet (1,011 m) at the point on the eastern boundary of Yuma County where the Arikaree River flows into the state of Kansas. Geography of Colorado Facts for Kids. Kiddle Encyclopedia.